Sometimes it’s hard to find a hook. You want something interesting to lead off a piece about a team, something to keep the reader around. For the Buccaneers? Well, their last 10 years is a lot of “meh.” Eight last-place finishes. No first-place finishes, no playoff appearances. Two winning records. If you can find something more than “meh” from that, more power to you. 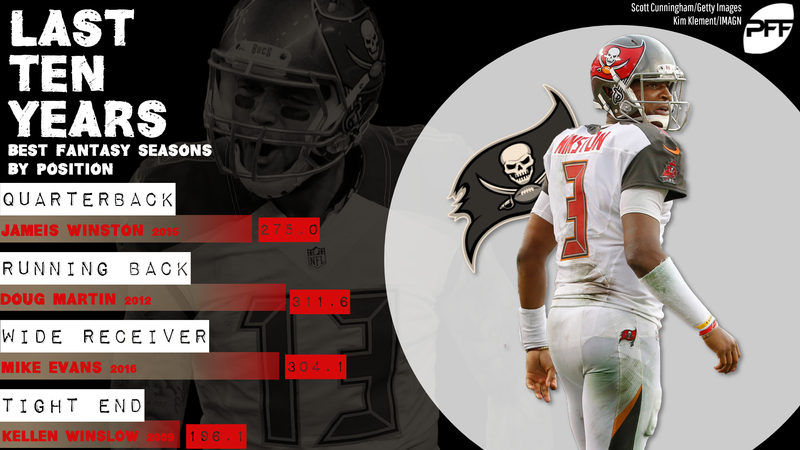 The most excitement out of the Buccaneers in this timespan came in 2018, when the team overall still wasn’t very good, but the offense provided plenty of storylines, between the back-and-forth at the quarterback position and the best-in-the-league receiver corps and the worst-in-the-league backfield. But that’s just one year. Let’s take a look at the best Buccaneers fantasy seasons of the last decade. On a points-per-game basis, Winston was better in 2018, which is all the more remarkable since he played only parts of several games as the team shuttled between Winston and Ryan Fitzpatrick like it was playing Pong. But that was only over 11 games, while he played a full 16 in 2015, his first year in the league. The jury’s still out on whether Winston will be a career Buccaneer, but he’s shown enough upside that the team could be forgiven for being patient with his football ability. Every once in a while, a brilliant new TV show gets canceled after only one season for any of a number of reasons. Inevitably, the show’s fanbase rallies to try to save the show. Sometimes it does, and sometimes the show stays brilliant. But sometimes it was a flash in the pan, the show unceremoniously dies a season or two later, and everyone basically agrees it should have stayed canceled in the first place. I’m not saying Martin would have been remembered better retiring after his 2012 season, but I’m not not saying that, either. Evans has now played five seasons, and all five of those seasons are among the nine best Buccaneers’ WR seasons in the last decade, with Vincent Jackson and Mike Williams each taking two of the other nine. He’s cleared a thousand yards in each of his seasons. And he doesn’t even turn 26 until August. But it was his 2016 season, after Jackson got hurt but before Chris Godwin and DeSean Jackson came to town, that it was just Evans and Adam Humphries, and it led to Evans’ career-best in targets and receptions and career-best-tying touchdowns, as well as a 91.7 PFF grade that is also his high-water mark. Evans isn’t in the conversation for the best fantasy receiver in the game, but he’s close enough to it that he can pretend to be. It feels like a fait accompli that this list will be topped by O.J. Howard before too long. His 2018 season is seventh on the list after only 10 games and 120.5 PPR points; extend that over a full season and he’d be and he’d be just shy of Winslow’s 2009, and that’s with Cameron Brate around and Howard still learning in only his second season. For now, though, the title is Winslow’s, and he holds three of the Bucs’ top four tight end fantasy seasons since 2009.